A massive gold-plated silver ring with an obsidian gemstone dating from the Late Middle Ages has been discovered by the archaeologists excavating the ancient and medieval rock city of Perperikon (Perperik) near the southern Bulgarian city of Kardzhali in the Eastern Rhodope Mountains. The team of archaeologist Prof. Nikolay Ovcharov has presented its latest finds from Perperikon with the completion of the 2015 excavations and restoration works in the rock city. 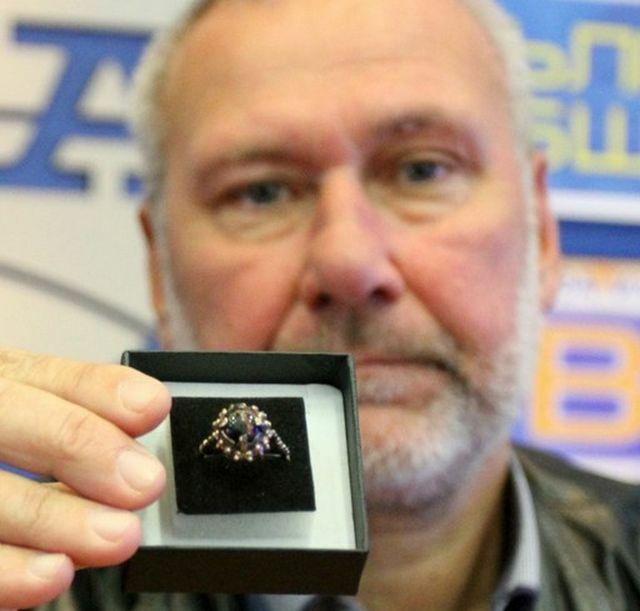 “We discovered the ring back in September but it was in a very bad condition, and covered with a thick layer of patina," Ovcharov explains, as cited by the 24 Chasa daily. He adds that the medieval ring has been restored by the finest goldsmiths and jewelers from the city of Kardzhali who have marveled at its sophisticated craftsmanship. They have been especially impressed with the fine polishing of the gemstone made of obsidian, i.e. volcanic glass, reports the Novinar daily. “This semi-precious stone is very hard to process so we have really come across an incredible jewel," says the archaeologist. It is believed that the gold-plated silver ring belonged to the wife of an aristocrat from the Second Bulgarian Empire (1185-1396 AD), or, alternatively, to a Byzantine noble as the Perperikon Fortress changed hands between Bulgaria and Byzantium a number of times in the Late Middle Ages. However, because of its large size it is also possible that the ring was worn by a man. 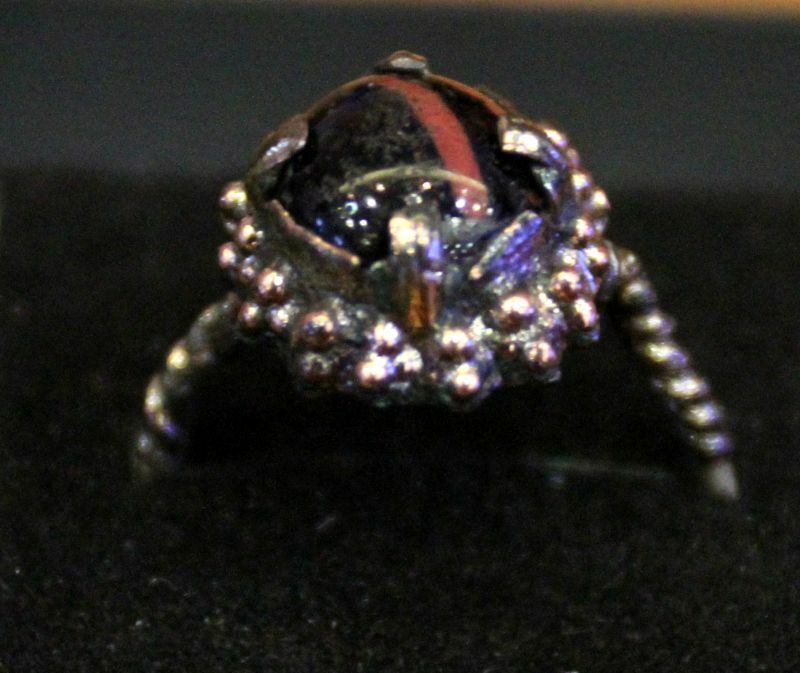 The discovery of the ring with the obsidian gemstone is said to confirm once again the wealth that the rock city of Perperikon enjoyed in the 14th century. The archaeologists have already found there hundreds of gold and silver coins, earrings and other decorations as well as crosses which are engolpions (encolpions), i.e. a (religious) item, for example in Eastern Orthodox Christianity, worn upon the bosom. Ovcharov points out that a 1337 AD document of the Ecumenical Patriarch of Constantinople states that the bishop of Perperikon was so rich that he was ordered to pay a pension to the metropolitan of the large Aegean city of Philippi. 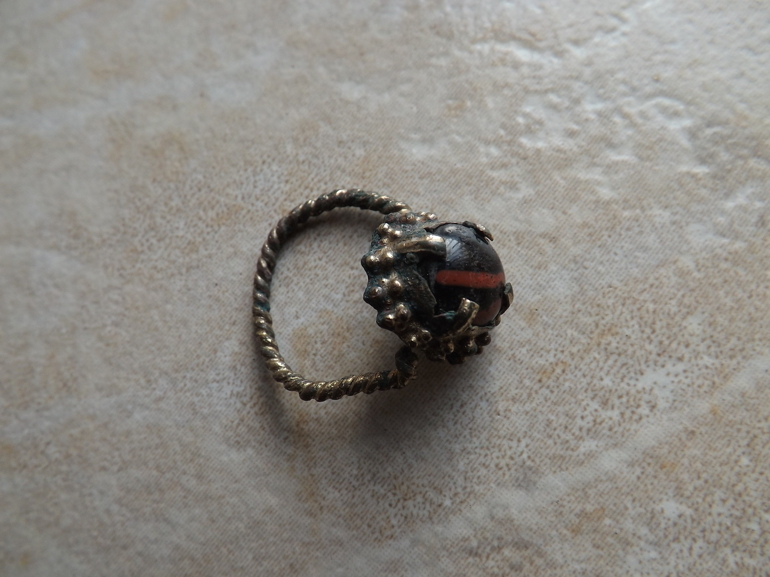 In addition to the ring with the obsidian gemstone, the latest archaeological digs at Perperikon have led to the discovery of several more medieval silver rings and earrings. Another intriguing find is a bronze figurine shaped like a horse hoof. It dates back to the Antiquity period, namely, the 2nd-3rd century AD, and is hypothesized to have been part of the jewelry box of a noble Ancient Roman woman. During his presentation of the results of the 2015 excavations of Perperikon, archaeologist Nikolay Ovcharov has declared the completion of the exploration of the acropolis of the ancient and medieval rock city. “During this season, we have completed the work on the excavations of the acropolis, and its streets, squares, and buildings. It turns out that even after it thrived in the period of Ancient Thrace, Perperikon continued to be a cultural and religious center during the Roman Era," Ovcharov points out. “We already have revealed the overall structure of a city with an extremely interesting planning, mostly from the Roman period. That’s something that until a few years ago none of the archaeologists envisaged – that there might be a city like this one from the Roman Era," adds the archaeologist. He reminds that his team has found a total of three temples from the Roman Era in Perperikon. These are: a temple of Apollo; a temple of the Thracian Horseman, also known as Heros, the supreme deity in the mythology of the Ancient Thracians; as well as a Mithraeum, a temple of Roman mystery cult god Mithra stemming from the Persian and Zoroastrian mythology. Ovcharov notes that his efforts at Perperikon will continue with the execution of a Norway-funded project for the restoration of some of the ancient and medieval structures in the acropolis of the rock city. In the upcoming years, he plans to excavate the southern suburb of Perperikon which is also said to be very rich in terms of archaeological structures. The 2015 summer digs have been the largest archaeological excavations at the rock city of Perperikon in the Eastern Rhodope Mountains in Southern Bulgaria since its exploration started 15 years ago. The excavations and restoration have been funded with BGN 220,000 (app. EUR 102,000) from the Bulgarian government, which is really lavish considering that a wide range of archaeological sites in Bulgaria have remained underfunded in 2015. Perperikon (also called Perperek or Perperik) is an ancient rock city located in the Rhodope Mountains in Southern Bulgaria, 15 km away from the city of Kardzhali. It is a large-scale archaeological complex including historical monuments from different ages. Those include a megalithic sanctuary dating back to the Neolithic Age, the 6th millennium BC, a Bronze Age settlement, and a holy rock city established by the Ancient Thracians later taken over by the Romans, Goths, and Byzantines, respectively. In the Middle Ages, especially during the time of the Second Bulgarian Empire (1185-1396 AD), it was the site of a strong fortress and a royal palace that Bulgaria and Byzantium fought over numerous times. Perperikon has been excavated since 2000 by Bulgarian archaeologist Nikolay Ovcharov who has found evidence that the mythical ancient Temple of Dionysius was located there. The rock city and fortress at Perperikon, not unlike the vast majority of the medieval Bulgarian fortresses, were destroyed by the invading Ottoman Turks in the 14th century. © 2019 archaeologyinbulgaria.com - All rights reserved.